Have recently renovated your restaurant, F&B, Bar and found that after the renovation works are completed your place sounds like a toilet? This is an acoustic unwanted problem known as acoustic reverberation and acoustic echo distortion. It filers normal soundwaves and makes environments unpleasant for all that use them. The result will cause your customers to leave earlier and loss of revenues as a result. NoiseBlock Invisible Acoustic Eco Treatment Systems is a revolutionary solution to unwanted noise our before and after results are remarkable in comparison to anything else on the market. The NoiseBlock Icoustic Invisable Acoustic Panel System is the only type of its kind worldwide. It blends into any environment and removes unwanted echo and reverberation where others fail. 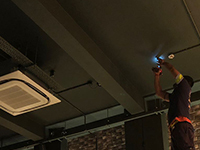 There is no alteration to the design and appearwence when installed, it blends in perfectly and creates the acoustic differences that will result in the increase of your sales. As you can see from the before and after installation in the image above the system blends in perfectly and is invisable to the eye.